Courtney Act, one fo Australia’s hopefuls for Eurovision 2019 has released her entry with which se will be competing in the national final Eurovision: Australia Decides. 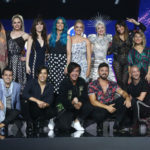 Just yesterday the Australian broadcaster revealed three more national selection acts who will be competing in the country’s first national final. Among the three names was that of Courtney Act’s . The charismatic drag superstar had already been assigned her song for the local selection shows which will be held on the Gold Coast and today was the first contestant to release her national final entry. The song entitled Fight for love unfolds in a dance /pop sound. Composer of it is Courtney Act herself alongside with Danny Shah, Felicity Birt, Sky Adams. The 36 yo drag superstar is one of the first artists to show their gender fluidity during season one of Australian Idol.In 2014 she returned to television as one of the top 3 in Season six of RuPaul’s Drag Race and in 2018, she entered the UK Celebrity Big Brother house. What do you think of Courtney Act’s entry for Eurovision: Australia Decides? DO you think she can win the national final with this song? Stay tuned on the INFE Network for more news about the Australian national selection for Eurovision 2019.